All Black Thunder Folding Knife | BUDK.com - Knives & Swords At The Lowest Prices! Don't let its size fool you, this folding knife packs some power! 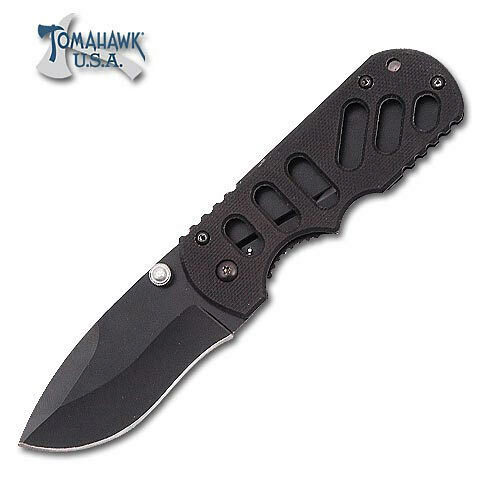 This folder features a 2 3/4" stainless steel drop point blade with black finish and dual thumbs to provide easy opening and closing. The black G10 handle offer machined cutouts to deliver a firm grip and includes the liner lock mechanism as an integral part of the reverse handle scale. This folder measures 3 1/2" closed and includes a handy stainless steel pocket clip. Tomahawk, XL1316.